This salad is packed with fresh ingredients, flavor, and nutrients – and it’s so filling to boot! Roasted sweet potatoes (high in beta carotin and vitamin A), black beans (high in fiber and protein), corn (a good source of fiber and vitamin C), avocado (full of good-for-you good fats), tomatoes (a great source of antioxidants, as well as vitamins A and C), and lean roasted chicken combine for one exciting salad. And I haven’t even gotten to the dressing yet. I wanted a ranch-style dressing for this colorful salad, but didn’t want all the calories that a sour cream and mayonnaise-based dressing would yield. So I did what I always do when looking to make my recipes healthy while keeping them creamy (like in this penne vodka) – I used Greek yogurt! 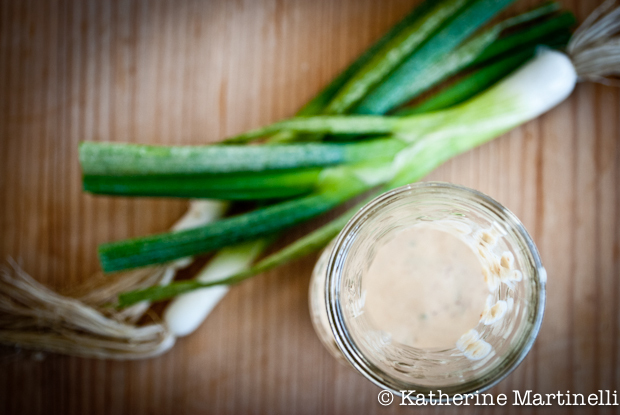 Combined with buttermilk, garlic, scallions, and chipotle in adobo this dressing is a luxurious texture with a slightly spicy, smoky, tangy flavor. It’s so good! Use a little less buttermilk to keep it thick enough to be a dip. 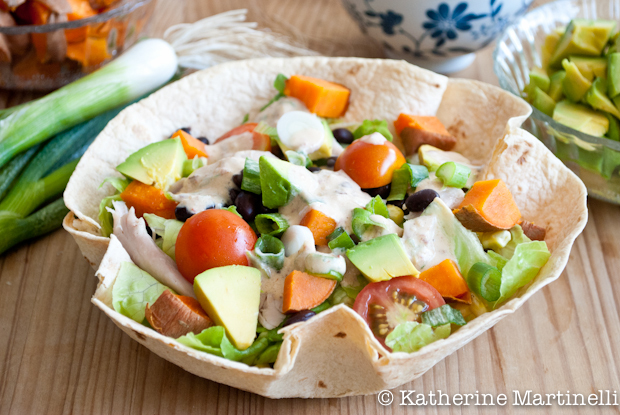 This Southwestern-inspired taco salad in a fun and edible tortilla bowl is a hearty, healthy meal. You can use any dressing you wish, but the skinny chipotle ranch is low in calories yet decadent and packed with flavor. Put each tortilla inside an ovenproof metal bowl so it fills the inside and molds to the shape of the bowl (if the tortillas are a little stale put them in the microwave or oven for a minute to soften them). Bake for 15 to 20 minutes, until crispy and lightly browned. Remove from the oven and allow to cool before removing. It should keep the shape of the bowl. Remove from the oven and allow to cool slightly before chopping into bite-sized pieces. Either toss all the salad ingredients in a salad bowl and transfer to tortilla bowls, or layer directly in the tortilla bowl. Top with Skinny Chipotle Ranch Dressing and serve. Put the ingredients in a food processor and blend until smooth. Taste and adjust seasonings to your taste. Serve, or store in a cruet in the refrigerator for up to 1 week. Make vegetarian and kosher dairy by omitting the chicken. Make gluten free simply by omitting the tortilla bowls (still delicious, I promise) - or use GF corn tortillas. What a whopper of a skinny salad! I love the combination of veggies in the tortilla bowl, ‘and’ that dressing sounds phenomenal – a great kick with the chipotle! To me, this is a treat – I’d never think ‘diet’ when eating it! Beautiful clicks too! This looks like such a beautiful,healthy and delicious salad! Looks delicious! Great idea for a “Skinny link-up” this week 😉 I’ll check in regularly for new links as I’m forever riding the yo-yo with my weight. What a great idea to use yogurt in your dressing! Sounds incredible. I don’t care what you call it – it looks great! I love making salads in a tortilla bowl! With the baking process for the tortilla, I don’t feel the least bit guilty at the end munching down on the bowl. Great ingredients and I love the chipotle dressing! Thanks for hosting another wonderful hop! Nothing better than a bowl you can eat. Beautiful taco salad! I love the addition of sweet potato to the salad! This looks so so good. This salad looks so pretty and delicious! and love that it’s skinny too! Oh! I love how you photographed the “salad building” … go great! And I will definitely try this dressing too … it sounds wonderful! One of the reason’s I love your blog Katherine is because you take yummy, indulgent, iconic foods and make them glamorous. I would never think to do a taco salad, but this certainly makes me want to! Oh this one is so up my alley! I could live on Mexican food – no joke – so I’m constantly looking for ways to lighten it up. Wonderful! Taco salads are one of my favorite meals. I love the tortilla bowls and the skinny ranch dressing! What a gorgeous, colorful salad! I’m going to give that dressing a try. 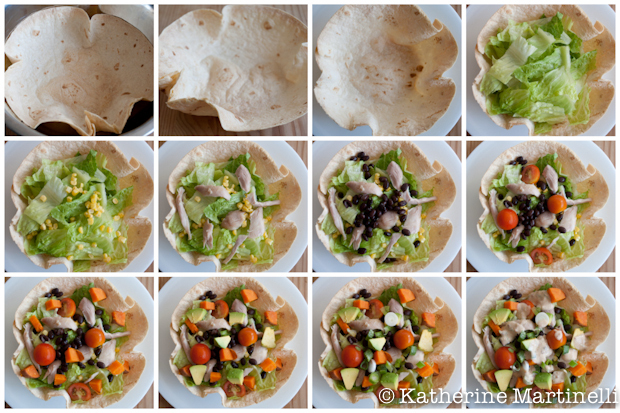 How interesting to make tortilla bowl! I’ve never made it before and I think my kids will love these new bowls. 😀 Must try! What a delicious salad. I’d eat this as main dish! This taco salad looks insanely delicious! Gorgeous flavours in it and so refreshing! What a delightful combination of healthy foods. Any thoughts on a dairy-free dressing for the salad? Thanks Linda! Great question. You could always substitute your favorite dairy-free vinaigrette – really any dressing would be great on this salad! Or, for a vegan ranch this recipe looks great: http://cleangreensimple.com/2011/04/vegan-ranch-dressing/ You could add some chipotle in to make it a chipotle ranch. I’ve also heard of people using cashews to give it texture. Great idea on the tortilla bowl! LOL, I had to do a bit of searching to find a healthy recipe on my blog 🙂 I LOVE your salad…a traditional taco salad has way too many calories! Your salad looks amazing and I love the step-by-step photos showing its assembly! I love doing recipe makeovers on my blog, I call them “Recipe Resuscitations.” I’ll share a few with you including my Southwest Shepherd’s Pie. Thanks for hosting such a great blog hop! Looks delicious! Have you found nonfat Greek yogurt here in Israel? I’ve only ever seen the full fat 9%. Any thoughts on which of the local nonfat yogurts would work well? I tend to just use plain 0% yogurt, but it’s fairly watery and the taste is meh. Thanks Robin! I haven’t found Greek yogurt that I like period in Israel. I also get the 0% regular yogurt then sometimes go through the extra step of straining it through cheesecloth or even a coffee filter so it is thicker and to my liking. I’ve been really happy with the 5% buffalo yogurt that I get at Eden Teva or the health food store (I forget what the brand is called but they also sell buffalo mozzarella) and the package is red and white). I like the flavor and it’s the thickest yogurt I have found. Nice recipe! Really like the way you made your taco bowls – much better than those package versions. Good stuff – thank you. Hmm great question Tara! I’ll start including something, great idea. Here it is! Sorry that doesn’t work. I put on on the html and you can see how it came up plus it doesn’t link over. http://noshingwiththenolands.com/?p=2665 It is at the bottom. Just linked up my favorite breakfast–baked oatmeal–and look forward to checking out some of the others. I see a bunch that look quite delicious! Have a great week! Thanx for being so creative.. Gotta Try it..